Is It Good? The Adventures of Track Suit Man #1 Review – AiPT! If you’ve ever traveled you know how damn stressful it can be. Everyone just wants it to be over with, but of course there’s always some screaming baby, some annoying crowd, or…Track Suit Man? No idea what I’m talking about? Well let this comic be your guide. Is it good? It’s safe to say that if you have ever traveled, you’ve experienced some jerk who has no respect for anyone around them. It’s bound to happen, not so much because there’s always a jerk around, but more because travelling is, as we said above, stressful. Somebody is bound to not realize their behavior is irritating someone else, especially in such close quarters. But then there are the folks who take advantage of others who are stressed, tired, or just don’t know how to play the game. That describes these tracksuit folks and, god help me, they’re a bunch of bastards. This is a 27 page comic that you can grab off Comixology right now for $1.99. This comic is written from the perspective of one who has observed the Track Suit Man. In between seeing his antics our narrator ‘Facespace’s his friends to tell them he’s spotted him again. It’s as if he’s spotting a danger in order to warn friends and family. It’s a clever way to comment on the character, but also bring the focus of the events back to the reader. There’re plenty of examples of how Track Suit Man ruins everyone’s day and it’s pretty clear writer Len Mihalovich has experienced him in great detail. This comic reminds me of the comic strips in The New Yorker in that each example of Track Suit Man is like its own joke and situation. I wouldn’t be surprised if this comic was composed in that way as there’s not really a linear story of any kind; it’s basically example after example. This makes the book read like a collection of jokes rather than a narrative to read from beginning to end. That said, due to the structure of the Facespace aspect, things are tied together (albeit loosely). Many of the situations in this book are relatable or at the very least good things to look out for next time you’re at the airport. Much of the material within is something to relate to and I wouldn’t be surprised if every person who picks this book up nods their head in agreement. I didn’t find the book laugh out funny, but considering it’s listed with the disclaimer, “Be warned this is NOT a traditional comic book” in the description, it shouldn’t be all that surprising. I know this, after reading this you’ll wonder if this book should be distributed at airports so when Track Suit Man does rear his head, we can all shame him or her into being a normal person. The art is done by four artists: GB., Michael Kelleher, April Mihalovich and Phil Miller. Much of the art is done by GB. and Michael Kelleher, who employ a very graphic design look you might see in a fun presentation. The lines are thick and cartoony. This helps give the book a lighter feel that goes along with the mood. Phil Miller is much more detailed and offers up for the section on other social media people to look out for which gives them a more weathered feel. The book closes with other annoying characters in our daily social media lives. 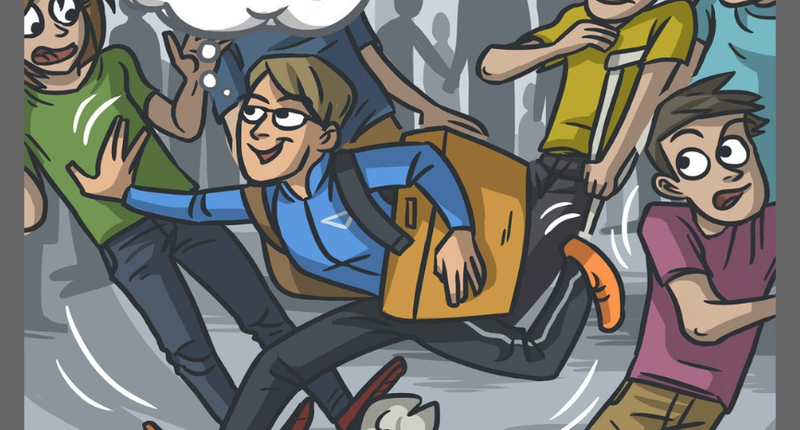 This comic succeeds in capturing a slice of life many travelers can attest to, and it’s a good wink and nod to those who need to commiserate over how awful human beings can be. I wasn’t falling over laughing, but don’t think a smirk won’t appear when you’re imagining how awful they (and hey, maybe you) are.